Check out Mitsubishi Heavy Industries latest range of heat pumps. They look fantastic and blend in with any dacor, they perform amazingly well and are packed with sophisticated features including the newest R32 Refrigerant for increased efficiency and power savings .They come with a well designed remote with daily and weekly timers or you can add the additional wifi module and you get even more control with the use of the very well designed smartphone app. ​Recommended by CHOICE® and boasting a huge range of features and functions including a powerful 18m air-throw, the Bronte® range of air-conditioners offer the perfect heating and cooling solution for larger rooms and spaces. 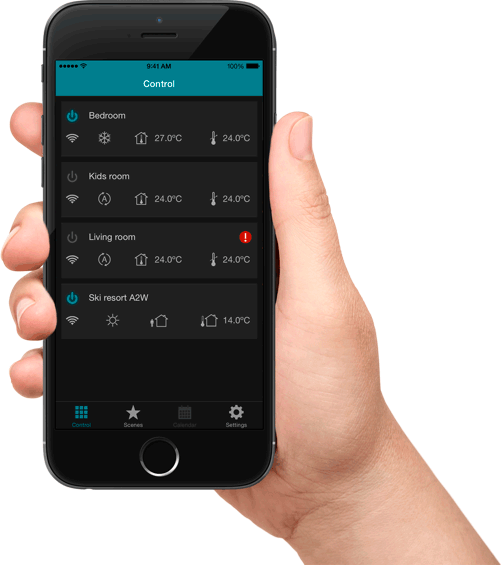 ​Controlling your air conditioner remotely has never been easier with the IntesisHome app. The intuitive app, available for both Android & iOS, allows you control your Mitsubishi Heavy Industries unit from your smartphone via either Wi-Fi or the internet. ​Recommended by CHOICE® and engineered by award winning Italian designers, the new Avanti™ range of air conditioners feature a sleek, stylish and modern design while also boasting a huge range of intuitive features and functions. Use the Mode button to select from Cool, Heat, Dry, or Fan Only operation or let the unit do it automatically when you select Auto option. Activate Hi Power mode to achieve the desired room temperature faster. Activate Allergen Clear function with a simple click of a button. Run for approximately 90 minutes, this program is designed to eliminate the allergens commonly found in the room air and effectively lock them away from your airflow. For maximum comfort, easily adjust Airflow Direction in your room by simply pressing L/R (for horizontal swing) and U/D (for vertical swing) buttons. By combining a start timer with a stop timer, you can register up to 4 timer operations a day (max 28 per week). Once set, the Weekly Timer will faithfully start or stop the system at a specified time of the day repeatedly. Select 3D Auto button to activate the three independent air flow controls allowing for an even airflow to be delivered across the entire room. Use Child Lock function to disable the controller and prevent inadvertent changes to the control settings from the youngest members of the family. Enable Night Setback to maintain your room temperature during cold conditions, even when the room is unattended. For more information on the functions available and how to access them on your remote control, please refer to your unit’s user manual. Enable Hi Power Operation which allows the unit to run continuously for 15 minutes to reach the desired room temperature quickly. Easily adjust the fan speed of the unit. Control the up/down flap swing of the unit. This function allows you to fix the up/down flap swing at your preferred angle for the continuous up/down swing. The next time you turn on your air conditioner the flap will return to the last position that it was in when the unit was stopped. Note: All wired control options require the SC-BIKN2-E remote control interface sold separately. Access the current room temperature of your home when you are at work or away from home. Program the air conditioner with a calendar schedule in an easy and intuitive way. Set the desired temperature, mode and fan speed. Control both the left/right louvers and the up/down louvers. The anti-frost function prevents the indoor temperature from reaching freezing point. By setting the temperature on a special set point, the unit will turn off before the temperature of the room becomes too cold. Note: Wi-Fi control is optional and requires IS-IR-WI-FI-1 Wi-Fi adaptor sold separately. ​The Avanti Series has been designed specifically to combine beautiful aesthetics with superior engineering. The smooth contoured appearance of the unit was conceived by award-winning Milan-based industrial designers, Tensa, to be a stylish feature in a diverse range of interior styles. This elegant and timeless series, best suited to small and medium living spaces, incorporates the superior engineering technology that provides quiet airflow for optimum comfort. The Bronte series is the ideal option for New Zealand’s large open plan living spaces. Engineered with the same blade technology as jet engines, the series features a remarkably long reach airflow, which provides a consistent comfortable indoor climate. With its performance-boosting 3D Auto, Hi Power functions and Dry Mode your rooms are maintained at a comfortable temperature without humidity. Recommended* by Choice, the slim linear design makes the Bronte series a winning option for indoor climate control that complements a modern lifestyle. Via our advanced technology and high quality components, the Avanti® series can operate in both heating and cooling modes in ambient outdoor temperatures as low as -15°C and as high as +46°C. So no matter where you’re living, you rest assured your unit will be able to withstand your local climate.